CardPresso is designed to make card production easy. Graphic design and personalization tools are included, both in PC or Mac environments. All the specifications of the cardPresso editions are detailed below. Start by XXS Lite with the basic features for card design and printing using predefined templates, signature acquisition, internal database up to 50 records, barcodes 1D, WIA/TWAIN and DirectShow acquisition as well as magnetic encoding. XXS adds an internal database with unlimited records. XS adds QR codes, .XLS, .XLSX, .CSV and .TXT database connection, database view and link image to DB field. XM adds local MS access connection, photo on database, FaceCrop tool for face recognition and 2D barcodes. XL adds ODBC connection, RFID contactless direct encoding and smartcard plugin, multi-layout card designs, conditional printing, operation logs and much more! cardPresso offers 6 editions in 18 languages. 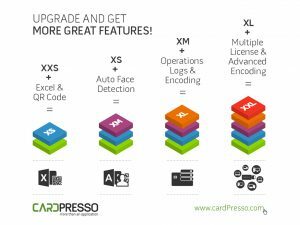 cardPresso works with large databases including MS Access, MS SQL, MySQL and Oracle: Native support for XLS, XLSX, CSV and TXT are also included. Continous development guarantees an application with the most up-to-date card technologies. Minor version updates are available at no charge. Upgrades to advanced editions are available online at any time. Numerous online tutorials, videos and FAQs are available. cardPresso also provides free and responsive technical support. 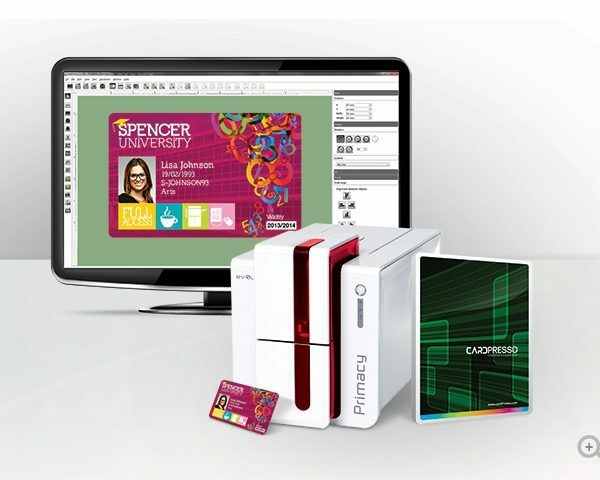 All the cardPresso editions have been tested with Zenius, Primacy and Quantum card printers and encoders, thus ensuring a perfect compatibility between your hardware and software equipment.